26th November 2009. Heaps of Christmas Gift Ideas, New Hema Navigator available for pre-order, and 2 New Treks - Glass Gorge Scenic Drive and Bunyeroo Gorge Scenic Drive. We've just developed a better way to keep you instantly informed about product releases, discounts, stock availability, and behind the scenes news relating to the ExplorOz Shop. On the Shop Home page you'll see a box with the heading "Shop News" and a lead-in sentence linking to our new Shop News Blog. This will provide easy access to information you won't get elsewhere and is a great way to connect with our Shop Manager, Adele who handles all inventory management, customer service and product despatch. Today, we feature a blog for all the new titles just added to the Shop - Gulf to Gulf – The Long Walk, Where the Eagles Fly DVD, Tasmania Atlas and Guide, and WA Caravan & Camper Trailer 50 Best Road Trips. Keep an eye on this blog - you'll be surprised how much new information we have to share. We hope this makes it easier for you too. The ExplorOz Shop now has the highly anticipated, all new, Hema Navigator available for pre-order, so make sure you don't miss out. 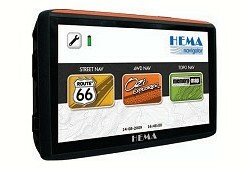 The new version of the Hema Navigator has a larger 5 inch screen, Bluetooth and FM transmitter, and it’s also rear view camera ready. Route 66, OziExplorer (loaded with all of the latest Hema 4WD maps, and a 250k topographic map of Australia) and Memory Map are all included, making sure you have the best options for Street, 4WD and Topo Navigation. This item has been given a release date January 4th 2010, and all pre-orders will be shipped immediately when stock arrives.Click to find out more. 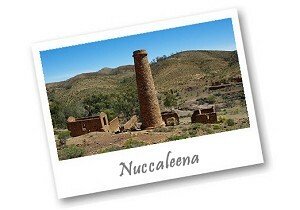 An alternative to Parachilna Gorge, the Glass Gorge Scenic Drive between Blinman and Parachilna offers some stunning scenery that the Flinders Ranges is renowned for, and a chance to visit the famous Nuccaleena mine site ruins. Built from local stone, these old ruins have withstood the rigours of nature for over 150 years and are still as stunning now, as the day they were built. If you happen to drive this route in spring after good winter rains, the country side will be covered in wildflowers and the creeks running with water. Click for the trek. If there is just one drive in the Flinders Ranges that you have time to drive, then the Bunyeroo Gorge Scenic Drive is one of the finest scenic routes not to miss. 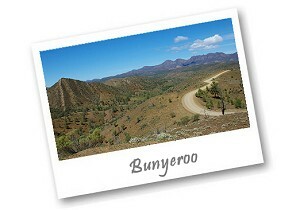 It does not matter how many times you drive this route, you will never get tired of the picturesque landscapes that unfold before your eyes, from sweeping plains covered in Native Pine to the rugged Gorges, the Bunyeroo Gorge Scenic Drive has it all. Click for the trek. We've taken your feedback and added new links at the bottom of each blog entry to allow readers to easily move to the Next, Previous or Index of any Member's blog. We've also improved the page print function - this is a site-wide change but started with feedback from David's mother trying to print out his triathlon blogs who complained the font was too small to read. So "because its Mum, it was done" and you'll all benefit from this improvement too. Enjoy! Member Messaging has also been improved with all Members now receiving email alerts to receiving new messages. This means you don't need to be logged in to ExplorOz to know that someone has sent you a MM. By end of today we also hope to have introduced Member Message functions for our Business Members - this will also work in the same way as for Personal Members with the new email alert feature. Blue Tongue Campers present a range of off-road and semi-offroad camper trailers at an affordable price. Omni Motorhomes handles Bus Conversions, Retrofitting, Re-fits, Repairs and Advice.